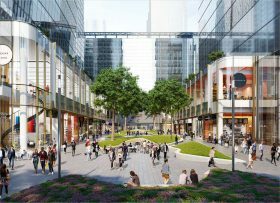 Brookfield Office Properties offered a look at the second building in the nearly-six-million-square-foot, six-building Manhattan West project to be completed. 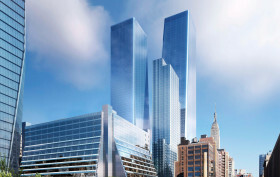 The 16-story office building known as 5 Manhattan West, where Amazon signed a lease for a 360,000-square-foot space, is approaching completion on Tenth Avenue between West 31st and 33rd Streets across from Hudson Yards. Archpaper shares images of the building’s sparkling new look and interiors, the result of some fancy architectural footwork by REX. The 1969 Brutalist office building was nearly everyone’s example of ugly since a 1980s renovation left it clad in brown metal and beige paint. 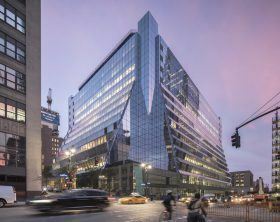 The rechristened building’s new facade wraps it in sleek, form-fitting pleated glass that does more than just look pretty.